Ikiru and Juno watched and reviewed. 13 down, 14 to go. Welcome aboard! Hope you have as much fun doing it as we do! A spaceship returns from a trip to Venus and lands in the sea just off the coast of Sicily. Only one lone U.S. astronaut (William Hopper) survives. A young Italian boy discovers a container that contains a lifeform the ship has brought from Venus, setting in motion events that will result in the ever-growing Venusian beast going on a rampage in Rome. I think this movie proves that kids in monster movies are evil...evil! He finds the container and what does the dope do right away? You betcha, he opens it! Luckily, unlike many monster movies, the kid isn't there till the end...once they leave Sicily for Rome, we don't see him again. 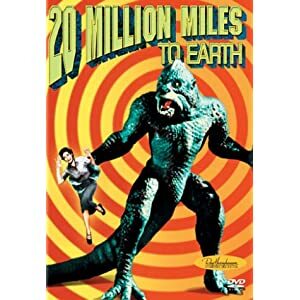 This is a first-rate sci-fi flick from the 1950s, aided by first rate special effects by the king of stop-motion effects, Ray Harryhausen. I got this in a set of 5 of his films...it's since been released in a 50th Anniverary Editiion...that includes a colorized version of that film. We certainly don't need that. This just has the original black & white version and the print looks great. If you like good science fiction films from this era, you know you want this one. The Adventures of Robin Hood - great fun classic, basically the template for most other Robin Hood films to come after it. Swashbuckling galore with some romance thrown in for good measure. drags a little in the middle, as they all do, but otherwise a great way to spend 100min, especially in a afternoon. Hot Fuzz - getting better on repeated viewing. Looks gorgeous on Blu-ray. #, A to G done. I done - Inkheart, 17 to go. Watched another one last night..up to 14 I think. I have got to catch up on the reviews though. Yes. FWIW I'm also doing a number. My next review is in. 3 down 4 to go. Still one or two reviews behind. This latest one really caught me out, so it's a bit long. Sorry. Full-on waffle mode, but bloody hell it deserves every bit of attention it can get. Kandahar and The Lake House watched and reviewed. 15 down, 12 to go. Only 6 down for me. I need to get a move on. I was planning to watch Yojimbo today. At the first scene it already felt way too familiar and a quick check then revealed that I had just watched during the last marathon in November. So, I quickly switched over to The Warrior King.